You can pay in any currency; exchange for USD or EUR is made at your bank rate.Initial purchase from $50 to $10000. Daily limit up to $20000. Monthly limit up to $50000. Sign in or Sign up, create or respond to an ad. Specify the currency and its amount, determine the purchase / sale rate. Make transactions! Now you can make profit on your rate. To learn how to use the P2P service, read the Short guide. 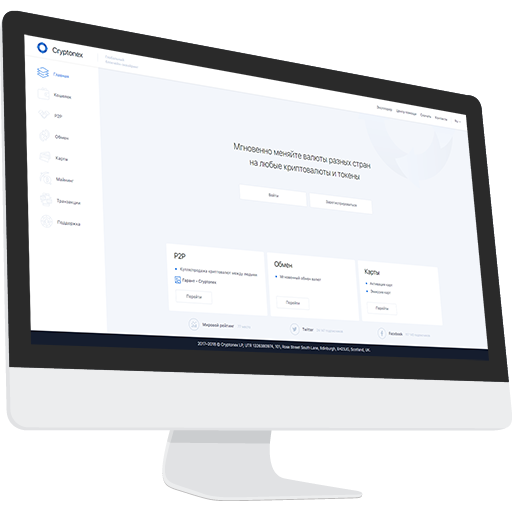 Store your funds safely in multiple currencies: Cryptonex, Bitcoin, Ethereum, Ontology, Brazilian Real, Euro, British Pound, Russian Ruble, US Dollar. The supported currencies are being added. You can top up your wallet balance using a QR-code or by a direct deposit to the wallet address. You can exchange all the supported currencies in the wallet. The service of BTC and ETH purchase using bank cards is available anywhere in the world. Cryptonex has developed a solution for business - invoicing counterparties in cryptocurrency indicating the payment purpose. The invoice is issued in any supported cryptocurrency. You can specify the invoice expiration date. The issued invoice will get to the counterparty's backoffice for payment. In the Invoices section, you can always check the invoices status and their payment. 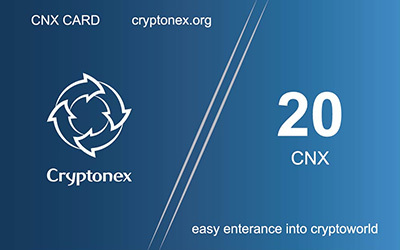 The service has been developed as part of the "Merchant" service preparation from Cryptonex, which will allow connecting online stores and retail companies for payments in cryptocurrency. The card has open and closed code. You can check your card balance without balance activation in the wallet. When activating the card, the balance will be deposited immediately. The cards are issued with the nominal of 1, 5, 10, 20, 50, 100 CNX. 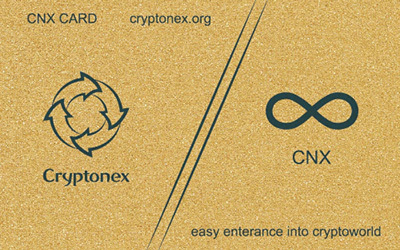 The card has its own virtual analogue - the code. You can create and send the card code with your nominal value in your backoffice. You can top up your card balance with any supported cryptocurrency in your backoffice. The card has open and closed code. The recipient of your card can check its balance without balance activation in the wallet.